GSC CITYONE MEGAMALL Kuching Opens 11th April 2013! 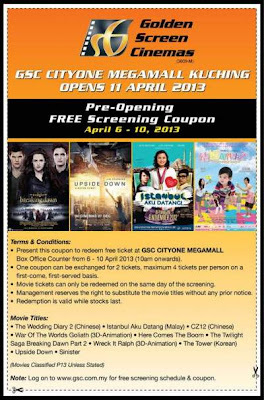 GSC is giving away pre-opening FREE screening coupon, available for redemption from 6th till 10th of April, 2013. Click and print out the coupon above to redeem free ticket at GSC CITYONE MEGAMALL Box Office Counter from 6th to 10th April 2013, starting from 10:00AM onwards. Each coupon can be exchanged for 2 tickets, maximum 4 tickets per person on a first-come, first-served basis. Movie tickets is valid on the same day of the screening. Join us LIKE & SHARE out this FREEBIES to your friends, will ya?